Here is a new way to add kale to your dinner table. Kale, tomatoes, and portobello mushrooms sauteed with garlic and olive oil turn brown rice pasta into an easy weeknight meal. Now, I’m not a fan of regular pasta, but brown rice or bean-based pastas get my stamp of approval. Tinkyada brown rice pasta is my absolute favorite, and you can find it for a good price on vitacost.com. (I’ve tried many brands, it is the best by far. Use this coupon for $10 off an order of $30 or more at Vitacost). And the luscious looking “cheese” you see on top is not really cheese at all. It’s what I like to call “almond parmesan”. It’s simply almond flour sprinkled on top along with a high quality salt (like pink or celtic). If you don’t have almond flour on hand, you don’t need it, but somehow I find it even more appetizing. It adds a buttery richness, and visually, is just appetizing. I guess it reminds me of my youth spent devouring plates of pasta covered in cheese. This is a great trick to use if you are weaning yourself (or any picky eaters) off of cheese. They will never know the difference. 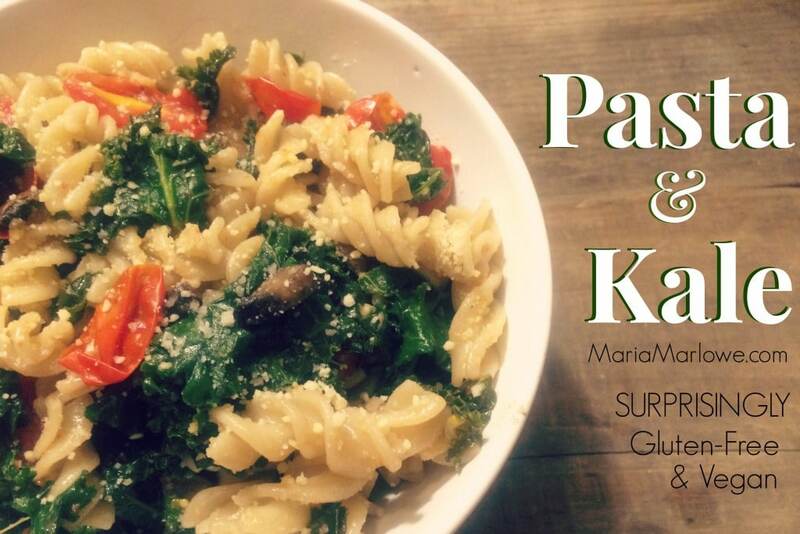 A gluten free, brown rice pasta with kale, cherry tomatoes, and portobello mushrooms. Bring water to a boil in a pot. Add pasta and cook for appx. 10 minutes, or until right consistency. Meanwhile, in a separate pan, heat enough oil to coat bottom of pan over medium low. Add tomatoes and portobellos, allowing to cook for about 3-5 minutes, until the tomatoes start to blister and soften, and the mushrooms start to shrink. Add garlic and stir, letting cook another minute or two before adding kale. Cover and let the kale steam for at least 3-4 minutes before uncovering and stirring well. When the kale is uniformly bright green and wilted, you can turn off the heat. By now, pasta should be ready. Drain, transfer to a serving dish, and then add the kale and mushroom dish and mix well. Season with salt and pepper to taste. When serving, add almond flour for a vegan "cheese" effect. This recipe works nicely if you are cooking for 1 or 2 people, simply quarter or halve the recipe. I made this on Thursday! Sooo yummy! SO glad you liked it! So easy and satisfying!